Home Moving Tips – Our Top 4! Are you looking to move property? It’s quite stressful and it can also be very expensive! In April we spoke to Lucas of We Move and Clean about some carpet cleaning tips. Lucas has been kind enough to come back and share his knowledge about removals also. He runs We Move and Clean based in Swindon in the UK. So as his business name suggests he is an expert at moving and cleaning. So there is no one better to provide some free advice on how to move properties. Clothes in the right draws and cupboard. All kitchen items packed away in their shelves and draws. Audiovisual equipment all in the living room. All books in book shelves. These are just some basic suggestions but I’m sure you get the idea. The point is that when you actually start to pack you will be packing systematically. If everything is all over the place different things will end up in different boxes. When you unpack in the new house you will spend a long time looking for different things in different boxes. Things will go missing and you will get frustrated. Would it be easier to organise things a little before hand? The answer is yes! While you can get away with boxes. Why not use plastic packing crates as well. The reality is that when you buy boxes the extra durable ones that are strong cost more. Not that much more but you can use heavy duty packing crates instead. You won’t have to worry about anything breaking as packing crates are strong and they will make you move a lot less stress full. 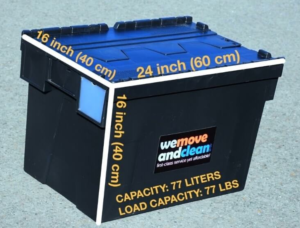 At We Move and Clean we use the packing crates. We offer a packing service for clients and they are very happy when they see us using them and we also hire them out. So if you are moving property what I would recommend is a packing crate hire. The reality is heavy duty boxes cost about £2 – £3 a piece if you buy in bulk. That is $3 – $4. And from my experience when the move is done the boxes going in the bin anyhow. So why not hire strong plastic packing crates instead? Pricing will vary but we hire crates out at £2 a crate. So you will actually save money vs buying boxes. Imagine this situation right now. You are in your new home. Everything is in the living room. No boxes are labelled and you turn to your partner and ask “what do we do all the boxes look the same…”. Not a situation you want to be in! This is a simple fix. Buy a marker and write the name of the room on the box. If you like you can write what is in the box also but the important thing for moving home is the name of the room. This way if you hire a company like We Move and Clean or you do the home moving yourself then you can have the boxes put in the rooms they need to go in right away. If you are moving yourself and are doing it on a budget the best option is to just hire a van. There are two options. The more expensive option is known as ‘man with a van’ and this is when you actually go to a moving company like us and we hire you the van with a driver. This way you don’t have to worry about driving a large van that you’re not comfortable with. Just be packed and ready to go. We come out. We help you pack everything into the vans. We drive to your new home and then help you unpack. It’s as simple as that. For this we charge £75/hour. Considering full service removals in Swindon costs over £1,000 when fully quoted up then £75/hour for a few hours is very cheap! If you don’t have much stuff to move and you are not moving far you could get away with only two hours work. We are a happy blog that provides home keeping tips. Read more about us here.